Synthetic peptide corresponding to Mouse Nuclear Receptor Corepressor NCoR aa 2427-2443. 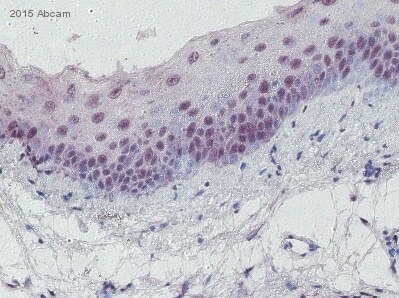 HeLa cell extract, mouse RAW 264.7/primary macrophages. Our Abpromise guarantee covers the use of ab3482 in the following tested applications. WB Use a concentration of 1 µg/ml. Detects a band of approximately 270 kDa (predicted molecular weight: 270 kDa).Can be blocked with Nuclear Receptor Corepressor NCoR peptide (ab4997). By Western blot, this antibody detects a protein at ~270 kDa representing N-CoR from HeLa cell extracts and mouse RAW 264.7/primary macrophages. Mediates transcriptional repression by certain nuclear receptors. Part of a complex which promotes histone deacetylation and the formation of repressive chromatin structures which may impede the access of basal transcription factors. Belongs to the N-CoR nuclear receptor corepressors family. The N-terminal region contains three independent domains that are capable of mediating transcriptional repression (RD1, RD2 and RD3). The C-terminal region contains two separate nuclear receptor-interacting domains (ID1 and ID2), each of which contains a conserved sequence referred to as the CORNR box. This motif is necessary and sufficient for binding to unligated nuclear hormone receptors, while sequences flanking the CORNR box determine the precise nuclear hormone receptor specificity. Ubiquitinated; mediated by SIAH2 and leading to its subsequent proteasomal degradation. ab3482 labelling Nuclear Receptor Corepressor NCoR in the nucleus of Mouse breast tissue (right) compared with a negative control (left) by Immunohistochemistry (formalin/PFA-fixed paraffin-embedded sections). To expose target proteins, antigen retrieval method was performed using 10mM sodium citrate (pH 6.0), microwaved for 8-15 min. Tissue was blocked in 3% H2O2-methanol for 15 min at room temperature, then incubated with primary antibody (1:200 in 3% BSA-PBS) overnight at 4°C. A HRP-conjugated anti-rabbit was used as the secondary antibody, followed by colorimetric detection using a DAB kit. Tissues were counterstained with hematoxylin and dehydrated with ethanol and xylene to prep for mounting. ab3482 labelling Nuclear Receptor Corepressor NCoR in the nucleus of Human breast carcinoma (right) compared with a negative control (left) by Immunohistochemistry (formalin/PFA-fixed paraffin-embedded sections). To expose target proteins, antigen retrieval method was performed using 10mM sodium citrate (pH 6.0), microwaved for 8-15 min. Tissue was blocked in 3% H2O2-methanol for 15 min at room temperature, then incubated with primary antibody (1:200 in 3% BSA-PBS) overnight at 4°C. A HRP-conjugated anti-rabbit was used as the secondary antibody, followed by colorimetric detection using a DAB kit. Tissues were counterstained with hematoxylin and dehydrated with ethanol and xylene to prep for mounting. ab3482 labelling Nuclear Receptor Corepressor NCoR (green) in the nucleus and cytoplasm of MCF-7 cells by Immunocytochemistry/Immunofluorescence. Formalin-fixed cells were permeabilized with 0.1% Triton X-100 in TBS for 5-10 minutes and blocked with 3% BSA-PBS for 30 minutes at room temperature. Cells were incubated with the primary antibody (1:200 in 3% BSA-PBS) overnight at 4 ºC. A DyLight-conjugated anti-rabbit was used as the secondary antibody. Red (phalloidin) - F-actin, Blue - nuclei. Images were taken at a magnification of 60x. ab3482 labelling Nuclear Receptor Corepressor NCoR (green) in the nucleus and cytoplasm of HeLa cells by Immunocytochemistry/Immunofluorescence. Formalin-fixed cells were permeabilized with 0.1% Triton X-100 in TBS for 5-10 minutes and blocked with 3% BSA-PBS for 30 minutes at room temperature. Cells were incubated with the primary antibody (1:200 in 3% BSA-PBS) overnight at 4 ºC. A DyLight-conjugated anti-rabbit was used as the secondary antibody. Red (phalloidin) - F-actin, Blue - nuclei. Images were taken at a magnification of 60x. Publishing research using ab3482? Please let us know so that we can cite the reference in this datasheet. I would like to know if it's possible to buy a larger Qty of NCOR1 abcam #3482 antibody. We use this antibody a lot in the laboratory and it's would be nice to have a larger Qty or a special price if we buy a couple of tubes of this antobody. We do not have any other sizes of ab3482 in stock. If you order 5 or more vials, we can offer a 5% discount and if you wish to place an order for 10 or more vials, I can out you in contact with our bulk sales team and they can work out a good deal for you. If there is anything else I can help you with, or if you are interested in placing a bulk (>10vials) order, then please let me know. What is recommended to use a positive control for Western blotting with this antibody? Thank you for your enquiry. Ab3482 was characterized in Western blotting using HeLa cell extract; by Western blot, this antibody detects a protein representing N-CoR from HeLa cell extracts. HeLa cell extract is therefore recommended as a positive control for this antibody. This antibody has so far been tested for cross-reactivity with human and has not yet been tested in other species. The datasheet previously said mouse, but I have updated it to reflect this new information that I obtained from the antibody's originator. If you have any additional questions, please let us know. We are still working on your question regarding ab84 and will get back to you soon. I was wondering if you could tell me whether your polyclonal rabbit Ncor1 antibody binds to Ncor's DNA-binding domain or not? We plan to use it for gel-shift analysis, so it is important that it does not. Thank you for your enquiry and your interest in our product. We have not tested this yet. If you decide to go ahead and purchase this product, please let us know how you get on and in return we will forward a reward of your choice, typically an Amazon gift voucher.